3rd year Pic 265 - Jun 29 2011 Dry cleaning! Indian Cormorant (Phalacrocorax fuscicollis) at Khem Vilas After coming out of the water (yesterday's pic) the Cormorant was drying itself in the sun. Cormorants and shags are medium-to-large seabirds. They are fish-eaters, dining on small eels, fish, and even water snakes. 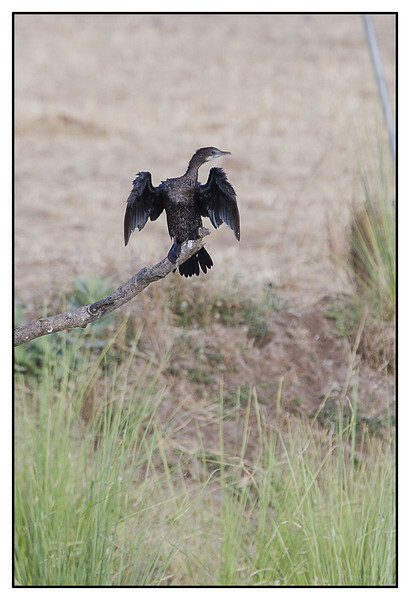 After fishing, cormorants go ashore, and are frequently seen holding their wings out in the sun. All cormorants have preen gland secretions that are used ostensibly to keep the feathers waterproof. Looks liek the dobule breasted commorants in US. They also hold out their wings to dry. Super catch, exceptional in X3! Outstanding capture and kind of funny! How interesting. Not a pretty birdie but great capture of the wings.